Join a private, customized, two-hour walking tour through New Orleans’ elegant 19th Century garden neighborhood and enchanting Lafayette Cemetery. This neighborhood and its cemetery tells the story of New Orleans from the Louisiana Purchase to the Civil War. Stunning antebellum mansions, lush gardens, unforgettable stories, and beautiful photo opportunities await! 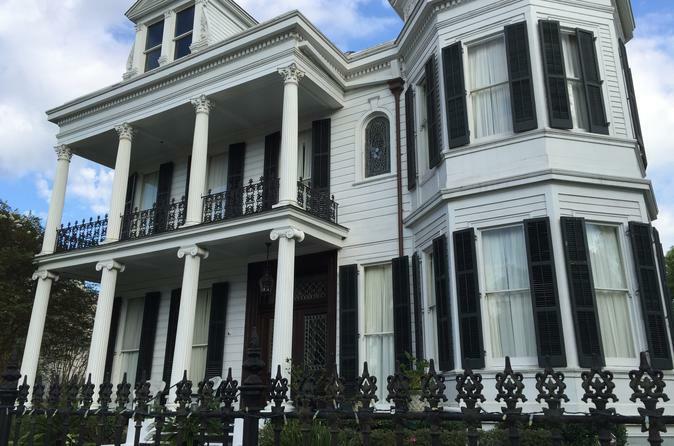 Your guide is an expert on the Garden District and New Orleans, so we can tailor the route and subjects covered to specifically satisfy the interests of your group. The night before the tour, your guide will send you their contact information and arrange a meeting place. This is your opportunity to tell the guide about your group - the number of people in it, their ages and levels of tolerance to walking, and their interests. This way, your guide can design a tour that focuses on what you want to learn about this fascinating neighborhood. Some like an overall introduction to the area, while others like to focus on the cemetery, architecture, history, literary history, or the dining and shopping corridor on Magazine Street. The tour usually meets at an award-winning bakery and cafe' on the St. Charles Avenue streetcar line, but since this is a private tour, we can arrange to meet you at any Garden District location. Your guide will give you a brief history of New Orleans and explain how the Garden District fits into the city's overall history, then you will embark on your adventure through the elegant tree-lined streets of this lush neighborhood. Your guide can point out the architectural styles that have become hallmarks of this neighborhood and tell you the stories of the fascinating risk-takers, speculators, and dreamers who established it as a wealthy American suburb after the Louisiana Purchase, as well as the many writers who have been inspired by its charm and beauty. Your tour includes a visit to Lafayette Cemetery #1, one of New Orleans' famed above-ground cemeteries and the location of scenes from several movies, TV shows, and music videos. Your guide will explain our interment customs and point out some of the more remarkable tombs and funerary symbols.